Tempur Sealy’s hospitality division knew that when selling their mattresses to hotels, the ownership and management companies that operate large portfolios — from five to several hundred properties — held the greatest potential for strong year-over-year sales. But the independent sales reps Tempur Sealy worked with had limited bandwidth, and the company didn’t know which accounts to focus on. The sales reps had other products to sell, too. Without solid information on which companies fit best with Tempur Sealy and why, reps had little reason to prioritize the company’s mattresses. This disconnect made it difficult for Tempur Sealy’s hospitality division to acquire accounts and grow. To overcome these challenges, we helped Tempur Sealy develop an account-based marketing (ABM) program that would determine the key accounts to pursue and create marketing and sales materials to close more deals. We analyzed each company’s portfolio based on their mix of properties, looking at brand parents, flags, segment scales and type. We also assigned a “friendliness” score based on sales reps’ relationship with each account and which organizations they thought merited attention. With this data, we developed an algorithm to determine annual and lifetime value potential. For each high-potential company, our telemarketing team verified the key decision-maker and possible decision-influencers, along with their titles. This became our target list. Targeted accounts received high-touch, personalized messaging throughout the funnel, positioning the mattresses as a differentiator for hotels. 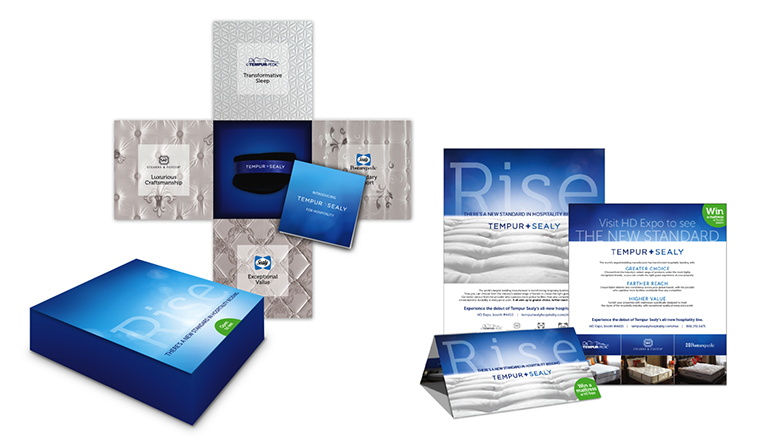 Decision-makers that aligned with one persona received a dimensional direct mail piece including a Tempur Sealy sleep mask, a personalized letter and an offer for a free Stearns & Foster mattress for a meeting. Our telemarketers followed up to make sure the package arrived, discuss how Tempur Sealy mattresses could add value to their hotel, and schedule a meeting. Sales reps received territory playbooks and deliverables that provided information about every management company in their territory, including details for every property owned or managed, showing how Tempur Sealy could add value at both the property level and the corporate level. We also used the deep data analysis to prep highly personalized sales presentations and automate the production of proposals showing how investments in a superior sleep experience can increase guest loyalty, occupancy and room rates. Tempur Sealy’s ABM strategy has helped the team get in front of accounts that represent the best opportunities. Through this effort, the team successfully connected with 52% of the targets and scheduled appointments with 19%. This represents a total potential of nearly $25 million in sales for the company. The sales reps can now target key accounts in a more purposeful, sophisticated fashion, using territory playbooks with specific goals as well as marketing and sales support, lead generation and appointment setting. They know where to focus their efforts, based on revenue potential, and have the tools to start building long-lasting relationships that lead to ongoing sales. Want to know more about our account-based marketing services? Get in touch with an Mx expert. Interested in staying up to date with industry insights? Subscribe to our blog.